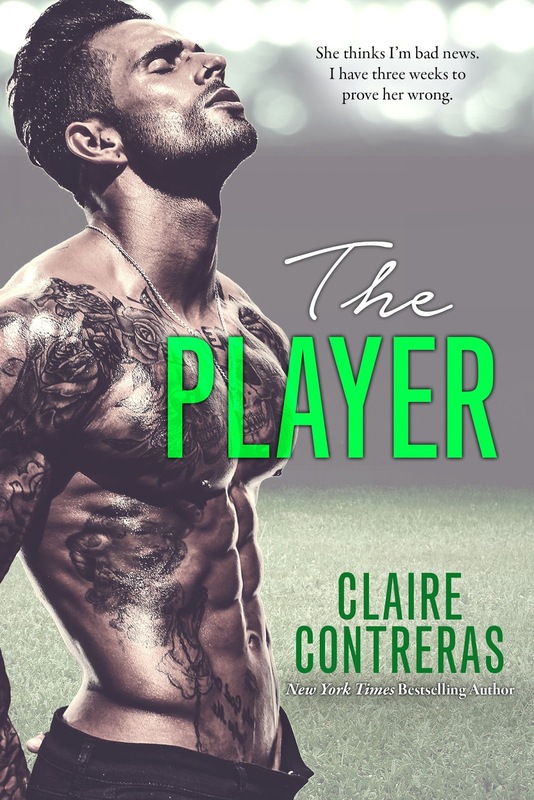 Claire Contreras is one author that I can guarantee will deliver a fabulous read and while I personally didn’t love, love, love this one she still took me on a journey. From the moment this cover was revealed all heads were turned, after all, he made quite the impact…but who is The Player? The Player is Warren Silva, he was a football (soccer) player in the UK and played for Manchester United. He was American but had been sent away from home when he was fourteen years old. Warren was at the top of his game, played for a great team, adorned many a billboard and had more money than he knew what to do with. With fame and fortune comes the ladies and this was something that Warren certainly made the most of, but this was born from a broken heart as his fiancée had cheated on him with a team mate. Warren is back in New York for three weeks, his estranged ailing father is ill and he wants to try and build bridges and he also needs to keep track of his investments. One of his investments is in a ruthless real estate business that is keen to redevelop the poorer areas much to the detriment of the current residents and business owners. It is at one of these meetings that Warren meets Camila. Camila was a beautiful character inside and out. Camila worked for a non-profit bringing safe places to play to youngsters in the rough areas, the under privileged to keep them away from the trouble on the streets. She loved her job and while it didn’t make her rich, it enriched her soul even though the student debts, her rent and bills swallowed up the majority of her earnings. Camila though made the best of what she had. As a child Camila had been on both sides, the poor and the affluent. Coming from the Dominican her family had started with nothing, her father then got a dream job, but it was only a dream for a while, a job that ended up with her father being incarcerated. When Warren and Camila’s paths cross Warren is immediately enamoured, but he soon realises that Camila is not like a groupie, for the first time in his life he has found a woman who knows nothing about football and knows nothing about him at all. With her “I couldn’t care less” attitude towards him Camila only makes herself more attractive and although he is being made to work at it for the first time in his life, he is relishing the chase and boy does Camila make him work. Warren and Camila actually get along like a house on fire, while they are total opposites, together they did work. Taking it slow in the beginning lasted days and before long she is on a plane to Manchester to see Warren in action. For me personally, the first half of this book was a tad slow, it didn’t hold my interest for some reason but because it was Claire Contreras I carried on. While the pacing was slow the actual development of their relationship was rapid and I think it was this that made me not connect to them as a couple. For me, Camila stole this book, she was such an endearing character and no matter the person, no matter the trouble she was always there. The underlying message of family values and loyalties was the message that rang the loudest and clearest for me. A family decimated from betrayal, yet came together, still had each other’s back and most importantly forgave. The second half of this book was engaging, I was a lot more invested in their story and couldn’t wait to see what would happen and how/if long distance was the way their relationship was going to go. With a little angst, a fabulous heroine and a swoony hero whose heart is in the right place there is something for everyone in this book. While it was predictable it left me with the warm and fuzzies which is what I love in a romance.